The saying is, “Old habits die hard.” Can-Am engineers learned that feeling well when three years ago development work began on a new model that was to be unlike anything they’d built before. Still, there would be some similarities; the new model would need excellent power, first class styling, and manufacturing excellence. 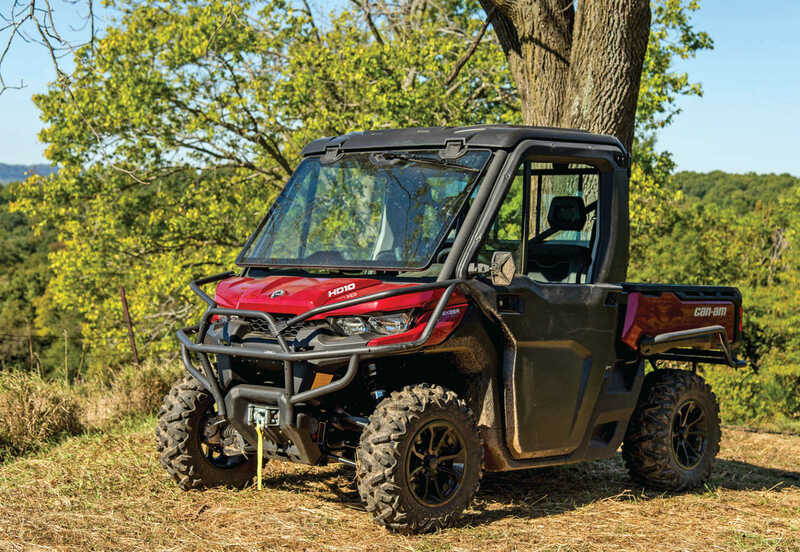 It was not all unfamiliar territory, but rather than for racing across the desert or dunes, the new model was aimed squarely at what had been the domain of the Polaris Ranger. This model was headed to work. Ironically enough, as Can-Am was going on the offense, the new model would be called the Defender. 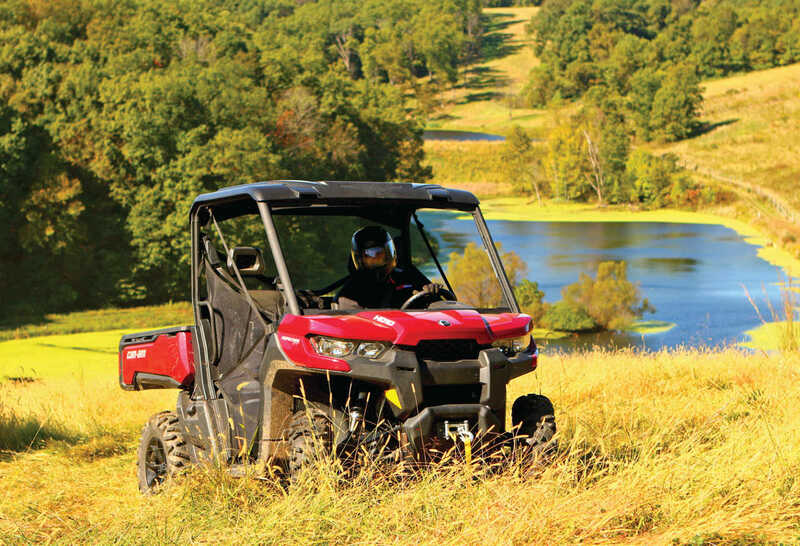 For over a decade the Ranger has roamed almost unchallenged in a category Polaris practically invented. 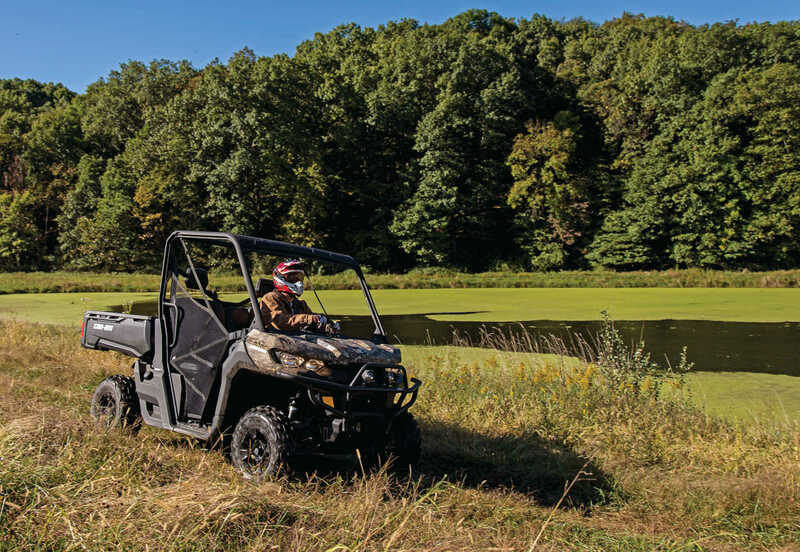 Not quite as heavy duty as the John Deere Gators or Kubota RTVs, the Ranger did offer superior maneuverability and increased comfort for recreational users. Along the way they have beaten a trail to every camp in North America, and in fact the recreational segment is the largest selling category in the sport. For Can-Am the opportunity was there to bring some new ideas to the market. 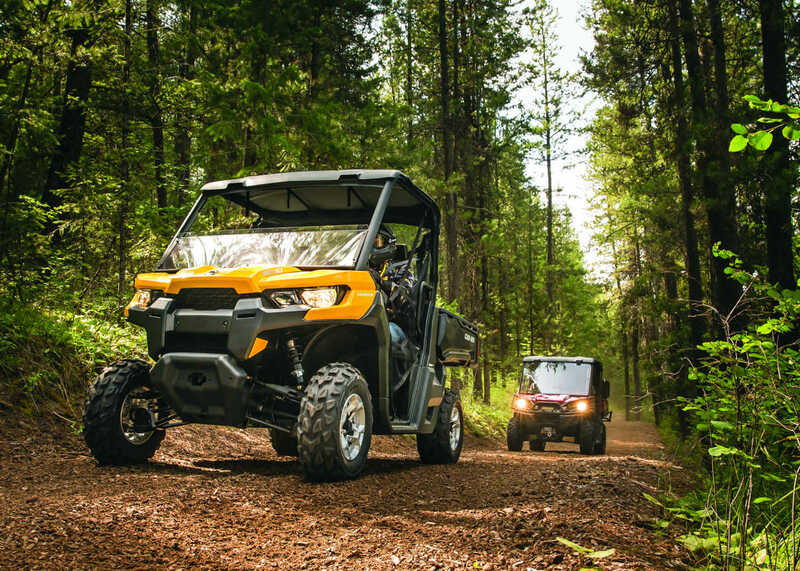 It’s no secret first year models can often be problematic, but after time with the new Defender Side x Sides, we can positively say the Can-Am team came well prepared. They’re not looking just to introduce a “me-too” model, but to change the game. And they have. 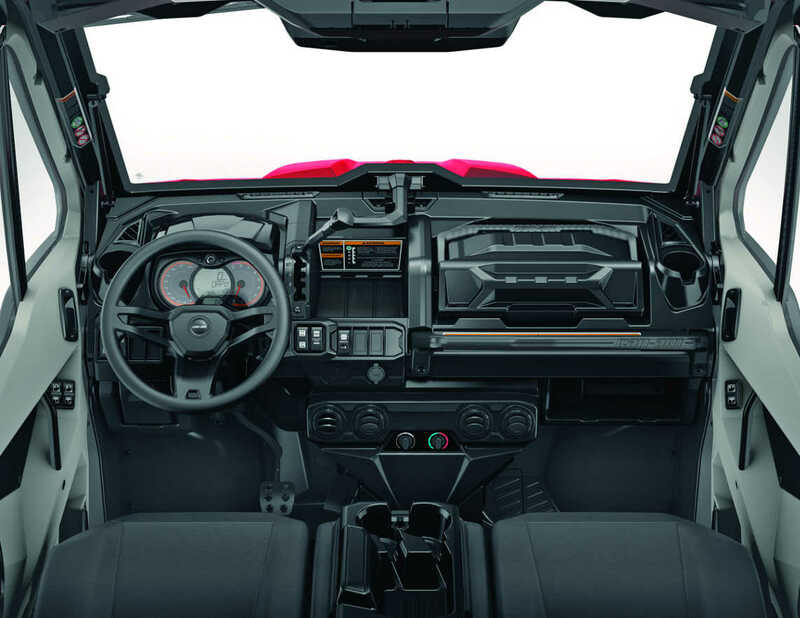 The new Defender is very refined and packed with details that set it apart. It all starts with a chassis designed for hard work and the first consideration is one of material. High-Strength, Low-Alloy steels were originally developed by the auto industry as a light but incredibly strong next generation material that would also pass crash test certification. It was also Can-Am’s first choice for the new Defender. 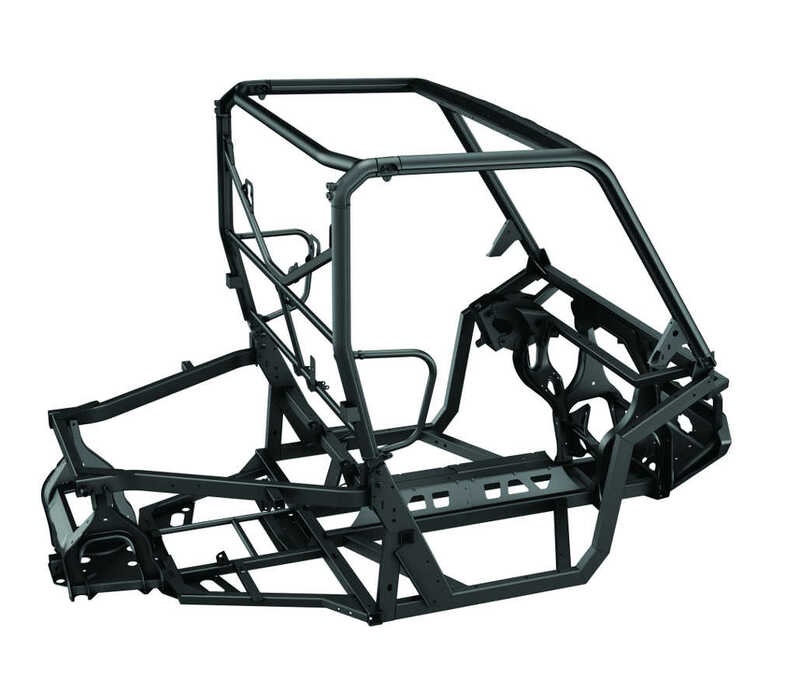 Overall the Defender chassis appears robust yet simple in design, with good use of both stamped and welded components. Can-Am also made use of what is known as “profile” tubing, which makes mounting accessory doors and windows a whole lot easier. Basically, the tube is rolled with a channel in it which works perfectly for locating windows and doors. This is nearly identical to the setup Polaris introduced with the Ranger chassis a couple years back, and according to Can-Am engineers, they were more than a little disappointed to see Polaris had beat them to the market with this feature since it was also planned for the Defender chassis which was still in development. Like most Side x Sides and ATVs, the Defender features dual-arms at the front, with twin piston disc brakes at each wheel. 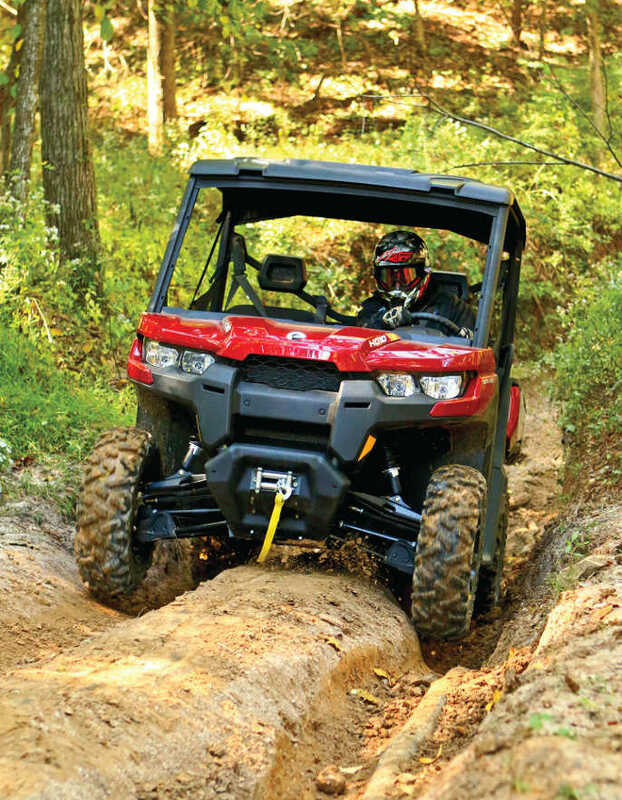 As much as Can-Am loves their trailing arm suspension design on almost every other model in their lineup, the Defender gets a modified suspension that looks more like dual A-arms. It’s very much like the suspension on their high speed Maverick, with the advantage of consistent geometry throughout the shock stroke. Wheel travel is listed at 10 inches at each end, with 11 inches of ground clearance. As with the front, twin piston brakes are found at each back wheel because if you’re hauling more than a ton, you had better be able to stop it safely. One feature we were happy to see is plenty of grease zerks on the suspension pivots, and even on the wheel uprights. This definitely improves both the pivot life and action. The Defender’s engine and transmission is placed under the rear dump box, and thankfully Can-Am engineers considered routine maintenance as well. There is an easy to find dip stick for quick oil checks, the cartridge style oil filter can easily be changed on the right side of the engine, and a large, canister style filter is readily accessible as well. Should you ever need to help a buddy out with a jump start, the battery is under the passenger seat. Better yet, get an RM Stator Portable Power pack and save yourself the trouble. There are two engine choices with the Defender. You can have an 800cc, 50hp (50lb-ft torque) engine, or a 1000cc, 72hp (61 lb-ft torque) engine. 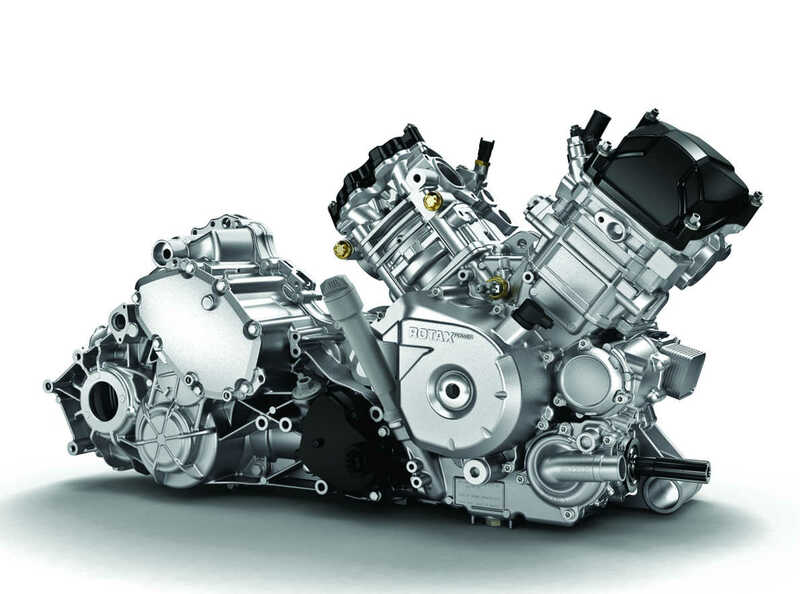 Both engines are based on familiar, V-Twin Rotax engines found in other Can-Am ATVs and Side x Sides, but the challenge for engineers was to rework the engines for maximum torque rather than maximum speed. This was a whole new concept for them. 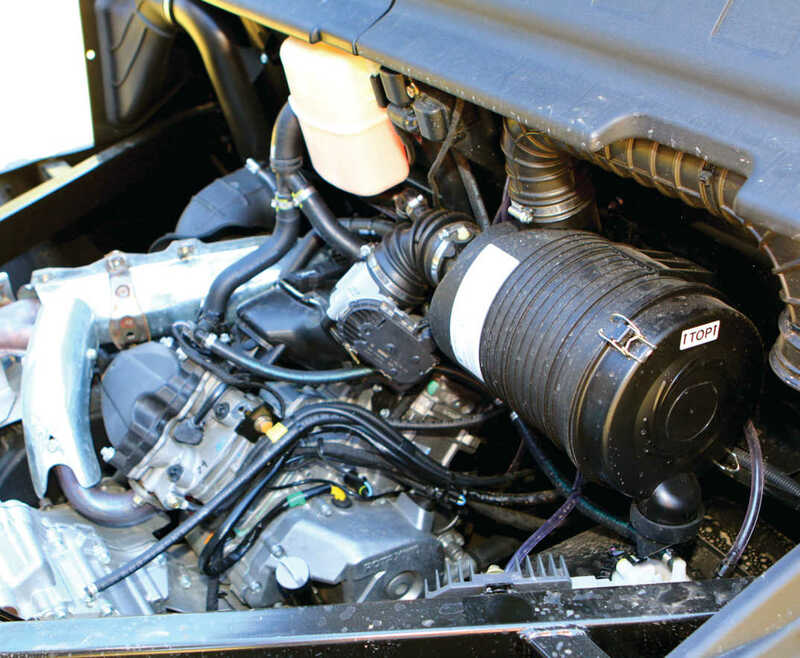 Both engines exceed the torque output of competing models. Mated to the motors is an all-new clutch and transmission. The PRO-TORQ transmission was designed for smooth, quick response and for the torque needed for heavy hauling. Heavy loads put a huge burden on the CVT belt and drive line, and as an added level of protection an Electronic Drive Belt protection system alerts the driver when they should be in low gear. When activated the vehicle will not move and a flashing “LOW GEAR” message appears on the digital gauge. Gearing is Park, Reverse, Neutral, High and Low, and the engines also feature a hill descent mode for creeping down steep slopes. Inside the gearbox helical cut gears provide quiet operation, and the rear differential is even part of the transmission package. 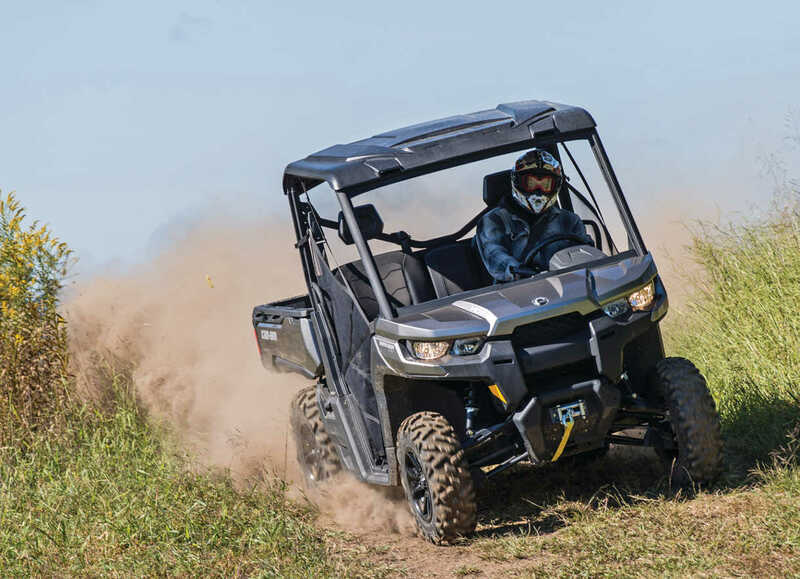 Can-Am equips the Defender with a multitude of transmission operating modes which can work for everything from sensitive turf, to deep mud, to rocky hill climbs. At the heart is their beloved Visco-Lok QE (Quick Engagement) front differential combined with the lockable rear differential. Thanks to two sets of switches on the dash, it’s possible to operate the Defender as a traditional 2x4 locked or unlocked differential, 4x4 open differential for added traction, or when things really get bad, a fully locked 4x4 differential. If you still have problems, get the accessory winch. RIDE TIME – HOW IT ALL FITS! The details on any new model are interesting, but what everyone wants to know is how it performs. The short answer is, the Defender is outstanding! Styling both inside and out plays a HUGE role in how a machine and rider interact, and the styling team did an EXCELLENT job in creating a working relationship. Absolutely no detail was overlooked! Once again cues came from the automotive industry and careful attention was paid not only to ergonomics, but to details like sight lines. Rather than a bulbous front end that limits one’s view, the Defender hood slopes down and out of sight, even to the point of appearing short. We do suggest that all of the Defender models look much better with the factory front bumper, and the extra protection is welcome. Inside the cab area the attention to detail really kicks into high gear and the dash console features all the controls placed within easy reach of the driver, plenty of storage, cup holders, and both passengers get a comfy, well designed hand hold. Both the wheel and hand holds get a nice textured surface for a secure grip as well. Just ahead of the passenger is one of our favorite and most clever features on any Side x Side. We love parts that have a dual use, and rather than simply placing a door on a hole in the dash and calling it good enough, the Defender has a combination glove box / tool box that fastens in place for riding, and by folding the carrying handle backwards it can be removed and used as a tool box! We LOVE it! On the top a scale is even molded into the plastic for quick measurements. 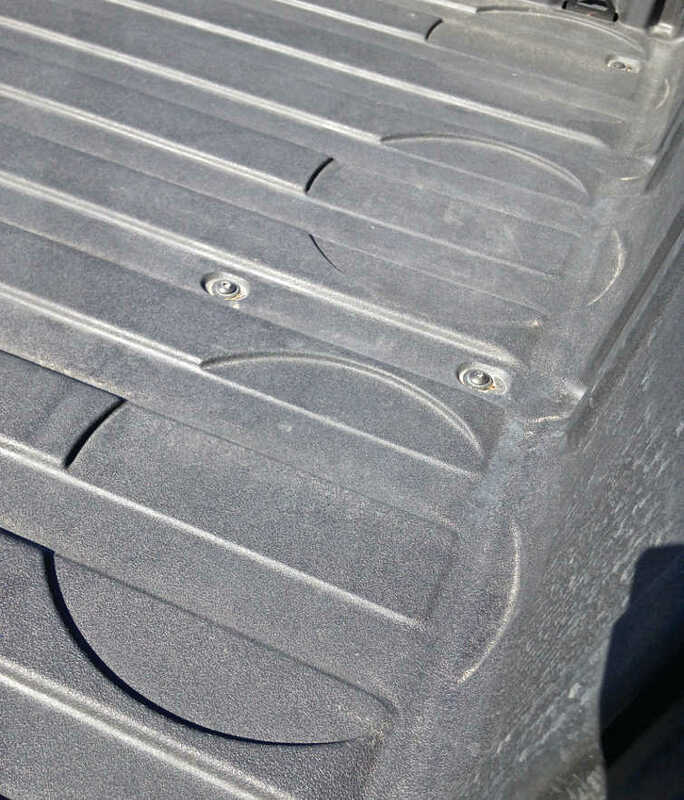 The innovation didn’t end on the Defender dash, and although it carries a bench style seat, the seat bases can be folded up to reveal open space beneath, or as space for a large removable accessory storage container. This has the dual effect of creating extra leg room which is extremely comfortable. 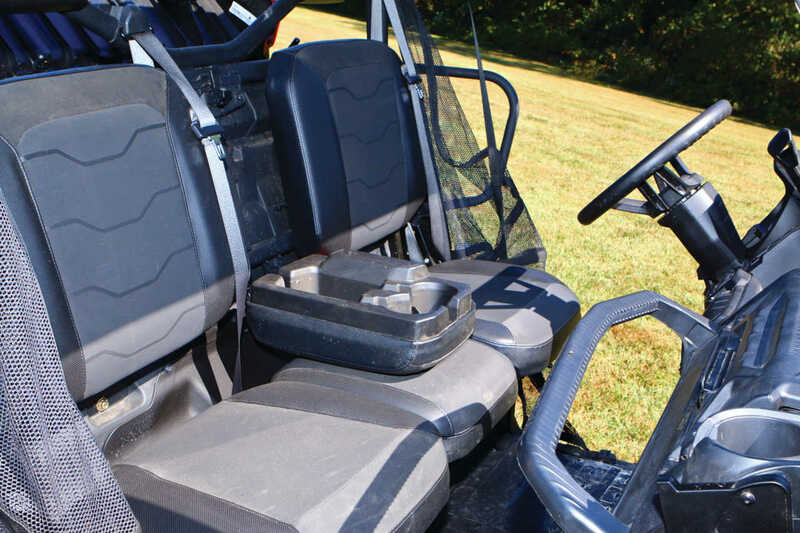 Finally, the center passenger back rest can be folded down just like the center arm rest on your truck, with extra open storage and cup holders molded in. Down below there is plenty of room for all three riders’ feet. Defender styling didn’t end with just the hood and cab area, and the styling is both great looking and highly functional. 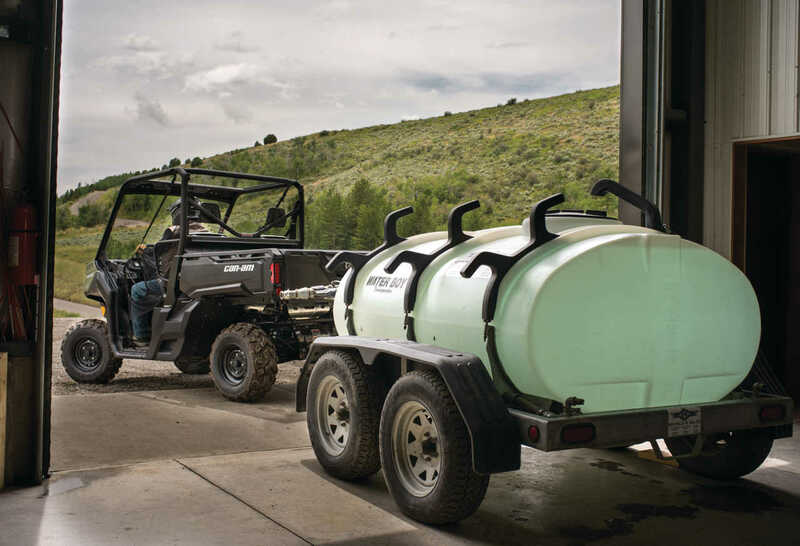 Anyone who has ever washed a Side x Side knows mud gets EVERYWHERE in the frame, but to help alleviate that problem the Defender gets wheel well protection much like the ones on your truck. It’s an awesome idea. At the front end that extra mud protection is even sculpted to duct hot air from the radiator out to the side rather than through the cab. Once again, it’s an example of innovative thinking and attention to detail. At the rear a huge composite dump box is capable of handling anything you can stack in it. The box also has an internal framework to increase strength and rigidity, just like its sturdy tail gate. Dividers are molded into the bed sides, but one of the most creative features is the circular bucket base holders at the front. Four shallow recessed areas help insure any tools, feed, nails, or whatever you are carrying in the bucket won’t be sliding around in the bed. It’s an awesome idea! Finally, a two inch hitch receiver is ready for towing up to 2000 lbs. On the trail the Defender is outstanding. The power steering creates the perfect amount of feel and feedback, and the engine responds quickly and crisply to throttle input. The chassis feels firm with no perceivable flex and we didn’t notice any squeaks or strange noises. There are gobs of torque for hauling, and we never ran out of power no matter what we were climbing or even with a full load in the bed and a ton hooked behind it. Engine breaking was noticeable in high gear, but had the most effect in low. We also thought this might be the best Can-Am clutch yet. It responds with barely perceptible shifts up or down. It’s the engine, though, that earns our highest praise. Even though it has been designed to match the hard working capabilities the rest of the Defender is built for, on the trail it’s as if it thinks it’s still in a sport machine. Winding through the trees is no problem, but when you find an open space, it’s happy to run! As good as the Defender is already, there is still room to improve and our biggest complaint is with the seat. It simply doesn’t match the rest of Defender’s quality. The foam is too thin and not nearly dense enough. We quickly sank right through it to all the comfort of what feels like a bleacher. Can-Am also wanted to allow for easy access, but there is only a slight area sculpted to hold your backside, and we found ourselves sliding back and forth easily. The seat definitely needs additional development. 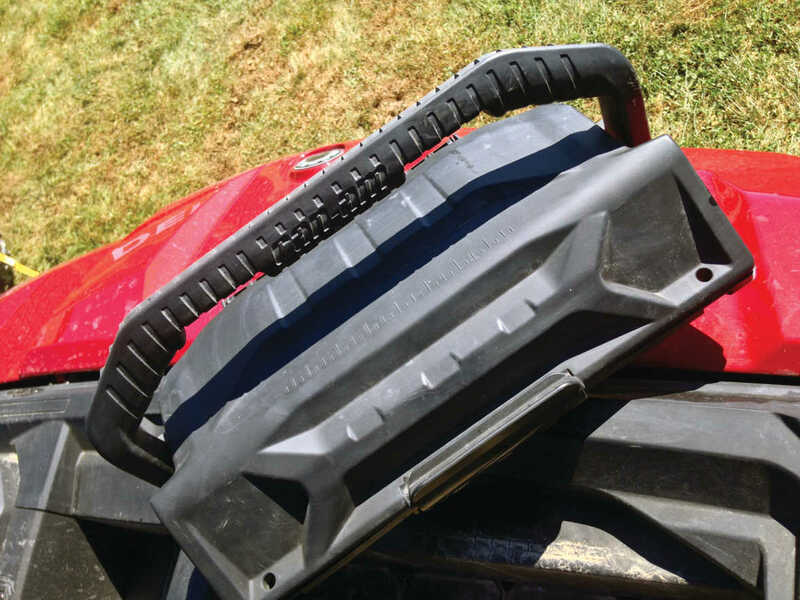 We’re not overly fond of the side nets either, and for some reason Can-Am abandoned their much more reliable seat belt style clip in favor of a plastic clip. Finally, we found the shocks could easily be bottomed in their fully soft setting. We clicked them up two notches to the middle setting and never bottomed again. We all know guys who never perform even the simplest maintenance task, often times at their own peril. Machines used around work sites or farms frequently see the same neglect, but Can-Am engineers were able to make ownership easier with an extended maintenance schedule. Because the Defender engines see less stress than their high-strung cousins, engine life was extended dramatically. Can-Am claims owners can forget about the traditional break-in period, and all that’s needed is a little love at 3000km (1865 miles) or 200 hours, whichever comes first! You read that right, and we even questioned it, but Can-Am was very clear they are fully confident in those numbers. If you’re like us, though, you won’t push it nearly that far and you’ll be sleeping much better for it. Can-Am didn’t invent the Recreational-Utility category, but they’ve certainly changed it. The innovation and attention to detail of the Defender is outstanding and approaches truck like quality. Heck, we like it better than our truck! It raises the bar on the quality of an off-road vehicle for the same price as competing models, and it’s a new standard to judge by. That’s a win for everybody! Note: Base Model EN Specifications shown. Upgrade model additions summarized below. 4x4 open rear dif., 4x4 locked rear dif. Protective Structure: ROPS-approved profiled cage. Certified ISO 3471 and OSHA.